If you're searching for the best bike rack for your car, truck or SUV, you're in luck. We researched the top models of 2019 and purchased 23 to test side by side. If you're like us, you travel with your bike often, whether heading out to an iconic destination, a nearby trailhead, or across town. We tested all types of racks, hitch, trunk, and roof mounts, on a variety of vehicles and with every type of bike. In our search to find the perfect bike rack we used and abused all of the models we tested and scrutinized every aspect of their performance. Read on to find out how these racks compare and to find the best one for you. The Thule T2 Pro XT is the best all around tray style hitch rack on the market. An awesome lightweight hitch rack, with unrivaled adjustability. The Sherpa is a lightweight hitch rack with some nice features and a good looking powder coat finish. High end durable hitch mount rack, with welcome upgrades to the original version. The Trio is an awesome fork mount roof rack that can hold almost any type of axle. We think this is the one. The Thule T2 Pro XT is without a doubt, the best all-around hitch mount bike rack in our test selection. A repeat offender, Thule holds down the top spot in our review for the second year in a row with the updated version of the T2 Pro. There was undoubtedly some strong competition from other new models on the market, yet it remained the highest scoring product in nearly every rating metric and again proved to be all we could hope for a bike rack to be, and then some. The "XT" is the newest iteration of Thule's popular T2 with notable changes in tray spacing and lateral adjustability that reduce the likelihood of bikes coming into contact with each other during transport. We also tested this with the Thule T2 Pro XT 2 Bike Add-On and found the combo was also our Editor's Choice for carrying four bikes. Overall, we found the ergonomics to be excellent, with ratcheting wheel clamp arms that can be adjusted with one hand, with a low loading height. Thoughtful design features are everywhere, down to the wide ratcheting arms wheel trays, giving fat bike enthusiasts a viable hitch mount option and compatibility with all sizes of tires and wheels. This game-changing product now offers the consumer something they never knew they needed. Sure, we've all enjoyed our hitch mounted rack's ability to tilt down and out of the way, but by simply moving the control for the feature Thule has improved the process and the ease of tilting the rack down, making it easier than ever before to access the rear of your vehicle. Add the tool-free attachment (trust us, you will not miss fiddling with a threaded hitch pin and lock) and you have our clear winner. Kuat maintains the top spot on our podium for roof mount racks for the second year in a row with their Trio. True to its name it comes out of the box ready to handle the three most common axle configurations. An improvement on the tried and true design of the fork mount rack, Kuat has come up with an innovative solution that can carry bikes with any axle standard at the fork. It comes out of the box ready to handle your 9mm, 15mm, and 20mm size axle forks, the Trio does not require an expensive adapter to hold your through-axle equipped bike, although an additional adaptor can be purchased to accommodate the wider fork spacing of fat bikes and plus bikes. Versatility is high on the list of the Trio's attributes and can be mounted to almost any crossbar style, using a U-bolt style clamp, and they also made a convenient cut-away for clearance of disc brake calipers that are common on modern mountain, road, and gravel bikes. A cable lock that extends from the back of the rack rounds out the great design, making the Trio the most versatile, secure and easy loading roof rack available. We think it would be great if Kuat included Boost compatible components with the Trio, but they are available as an aftermarket accessory for purchase. The Thule Raceway Pro 2 is our Top Pick for a trunk mounted bike rack. Thule has broken the mold with the only trunk mount rack in our test group that utilizes rubber-coated steel cables for mounting as opposed to the more standard nylon straps found on other models. The steel cables increase both security and durability and are easily adjusted to length and tightened with built-in, user-friendly knobs. Setting up the Raceway Pro 2 is easy, using Thule's Fit Guide that has number designations for all compatible vehicles. Using the Fit Dial on the rack to turn to the corresponding number achieves the optimum support arm angle for your vehicle, basically eliminating any guesswork. The support arms are adjustable in both angle and lateral spread, which increases the ability to carry a variety of frame types and sizes. The Raceway Pro is also the only trunk mount in our test selection that comes standard with a retractable cable lock system. Doesn't fit tires bigger than 3"
The Yakima HoldUP is not quite as refined as some of the competition, but it works well and is much less expensive than any hitch rack that scored higher. If you add on the 2 bike extension, you have a 4 bike rack that is hundreds less than any 4 bike hitch rack that scored higher. It's relatively easy to assemble and secure and scored a 7 or 8 in all metrics. The main downside is that the tilt and securing mechanisms are not quite as smooth as some of the more expensive racks. If you've never used the T2 PRO or Dr. Tray, then you probably won't notice this much. But if you have used the higher-end models, you may be a little annoyed at the ease of use. In addition, it doesn't hold tires fatter than 3-inches wide. Those two things aside, it's an excellent rack and a great price. The RockyMounts JetLine is the winner of our Best Buy award for a roof mounted rack. The Jetline isn't the cheapest roof mount rack in our test selection, but we feel you get a lot for your money. The JetLine is a rooftop, fork mount rack, and we found that it will fit both Thule, Yakima, Aero, and many vehicle's factory mounted crossbars with the included hardware. An easy to use quick release lever clamps any bicycle fork with 9mm dropouts, and the addition of the Drive Shaft (through-axle) adapter from RockyMounts, make this rack compatible with bikes equipped with 15mm and 20mm through axles. The tray is designed with a cutout to accommodate disc brake calipers, and a sliding, ratcheting strap used to secure the rear wheel on the tray. If security is a concern, the JetLine requires two lock cores, one secures the rack to the crossbars, and one locks the quick release lever to secure the bike to the tray. We think the JetLine is a good value that offers security and versatility, along with aftermarket add-ons you can purchase as funds permit. The highly anticipated Yakima Dr. Tray is the most recent and best hitch mount tray rack offered by this well-known brand. Make no mistake; this isn't an updated version of the Yakima's Hold Up rack. The Dr. Tray is a completely new design incorporating innovative features that we really like. Attached to the main body of the rack, the trays are adjustable with tool-free clamps that allow quick and easy fore, aft, and lateral adjustment to avoid bike to bike contact. We found the Dr. Tray to offer incredible versatility, and it was also boasted one of the lightest weights in its class. The recently released EZ+1 accessory easily increases this racks carrying capacity to three bikes, something we feel is a bonus to this excellent performing rack. Yakima's Dr. Tray only narrowly missed out on our Editors' Choice award, this was due to the less user-friendly tilt release, and a cable locking system that we feel could benefit from a redesign. Despite these issues, the Dr. Tray was a favorite among our testers for its light weight, versatility, and user-friendly adjustability. If you've caught the travel bug and have been drawn into the #vanlife circle and purchased a van to embark on your biking adventures, then you already know or are about to discover the potential challenges of transporting bikes on your travel rig. Fortunately, RockyMounts has you in mind, with a well-designed tray style swing away hitch rack made to meet the specific needs of the modern van-dwelling nomad. All other models of hitch mounted rack we tested interfere with the use of a van's rear doors, even when tilted down. Of course, the Backstage does have an impressive tilt feature that is accessed at the rear of the rack; the show-stopping feature is the arm that articulates out and away from the rear doors, putting both the bikes and the rack clear of the door's range. We don't feel that the Backstage is entirely perfect, the tray clearance from the vehicle is somewhat cramped, so bikes with 800mm bars need to be placed in the outside tray, and it is cumbersome due to its weight and size. Despite its imperfections, we still feel the swing-away convince makes it the most appropriate option on the market for the #vanlife crowd. Our testing began with purchasing the racks we selected, then using them on many outings. Freelance writer Jeremy Benson and multi-discipline bike racer Curtis Smith bring the experience and know-how behind this review. Jeremy is the author of two books - Mountain Bike Tahoe and Backcountry Ski and Snowboard Routes: California. A 16 year North Lake Tahoe resident, Jeremy races and rides mountain bikes obsessively. Curtis races for the Bikes Plus/Sierra Nevada team in road, mountain, and cyclocross. He recently placed first overall in the Sierra Cup Northern California Nevada Regional Championship XC Mountain Bike Series. Five categories of scoring criteria were identified as essential to effectively judge a bike rack. These include Ease of Removal and Storage, Versatility, Ease of Assembly, Security, and Durability. Testing Protocol for each category was tailored to suit that particular category. For example, an approach we took to test ease of removal and storage was to hand a given rack to someone with no prior knowledge of it, and observe the relative ease or difficulty with which they set it up. Over the course of our testing period, we rigorously tested each model on a variety of makes and models of vehicles. We tested each rack with a range of different types of bikes to test each model's versatility, user-friendliness, and to identify strengths and weaknesses. Our reviewers constantly scrutinized each model and kept meticulous notes during testing, ultimately scoring each rack across six different rating metrics. The final scores for the racks helped us determine our final test results listed above. Bike racks in this review range widely in cost. Some may want to shell out for the best of the best, while some may just be looking for the best value for their dollar. We've included a chart below, which details all 23 models which have been included in our fleet. If a high-performing budget model is high on your list, consider contenders that run along the bottom of the price line, but are far along the score line. The easiest way to tell which model offers the highest price per value is by starting at the bottom right of the graph. The RockyMounts Jetline and Thule T2 Classic took home our Best Buy Awards, while the Kuat Trio, is the winner of an Editors' Choice Award. For most of us, this is the bottom line. How easy is the bike rack to use? Generally speaking, the easier something is to use the more likely you are to use it, and you'll waste less time loading and unloading bikes leaving more time to dedicate to other things. We feel that ease of use breaks down to two things, how easy is it to load bikes, and whether or not the rack interferes with access to your vehicle. (We discuss locking systems in our Security test). The primary aspects we considered while evaluating loading the bikes are the loading height and the method of attachment. In general, issues with vehicle access are typically involved with hitch mount and trunk mount racks, and the method of mitigation the manufacturer uses and its effectiveness led us to our score. The highest rated hitch rack we tested is the Thule T2 Pro XT. Loading bikes on the T2 Pro XT couldn't be easier, with a low loading height and well designed front wheel clamps that help take the awkwardness out of balancing a bike while trying to place it in the rack. Other models we tested like the 1 Up Quick Rack require a more choreographed approach to bike loading to prevent those awkward moments where the bike is teetering, and you have run out of hands. In our opinion, one of the most standout features on the T2 Pro XT is the well-executed one-handed tilt release lever located on the end of the rack that makes lowering the rack or raising the rack more simple than we ever could have imagined. A similar system was employed on the new Yakima Dr. Tray, but we found the lever to be sticky, often requiring two hands and some rough treatment to release. Thule was the first to market with a rack with this feature and their expertise shows with this new design. The awesome tilt release lever on the Thule T2 Pro XT can be manipulated with one hand. Roof mounted racks are, as the name suggests, mounted on the roof of your vehicle; consequently, the loading height is invariably higher. This higher and less convenient loading height automatically lowers the ease of use score compared to hitch racks with their closer-to-the-ground convenience. That said, roof mounted models are certainly not all created equal, and we found the Kuat Trio to be the leader of the pack. The fork mount design is slightly easier to load than a wheel mount roof rack like the Yakima HighRoller due to the fact the bike doesn't need to be lifted quite as high, although the front wheel does need to be removed. The Trio and its innovative system that makes it compatible with through-axle forks without the need for additional adapters also helped it to outscore other fork mount racks like the RockyMounts Jetline. The orange piece on the Kuat Trio is removable, allowing different axel adaptors to be inserted to accomodate virtually any type of bike. The Thule Raceway Pro 2 topped the ranks for trunk mounted racks in ease of use. Thule has intelligently employed a ratcheting dial system to take up slack in the steel attachment cables, the only trunk rack that uses rubber-coated steel cables, which makes mounting easy, and their unique Fit Dial system helps you achieve the perfect fit for your vehicle by listing the appropriate dial measurements for almost all vehicles to take the guesswork out of the equation. It sure would be nice if we could leave our bike racks on our vehicles all of the time, but unfortunately for most us, riding bikes is just a hobby and not a full-time job. 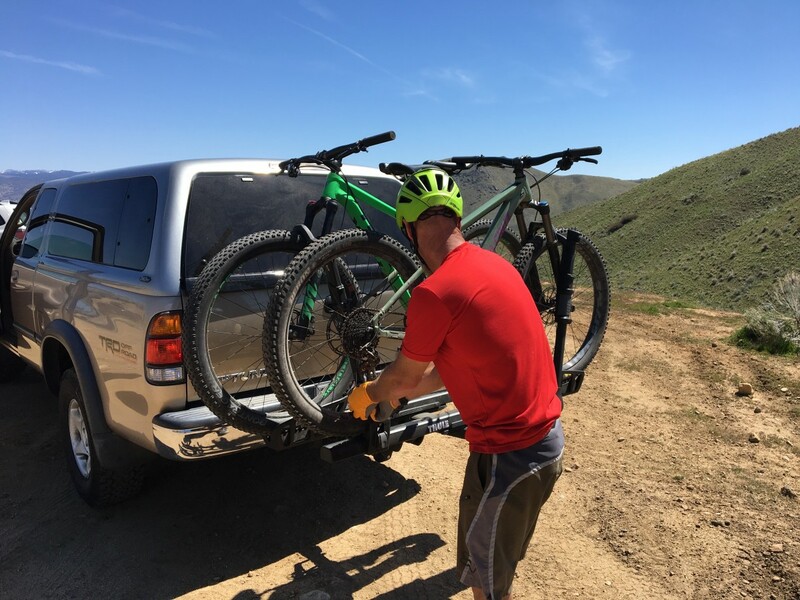 Bike racks are often mounted and removed from our vehicles as needed or as seasons change, and how easy that process is depends on a variety of factors. A racks size, weight, and method of attachment are the primary factors that impact their ease of removal and storage. Our highest scoring hitch rack in this rating metric, the Yakima Dr. Tray was the only rack we tested that earned a perfect 10. At a featherweight, for a hitch mounted bike rack, 34 pounds it weighs only half what the RockyMounts BackStage does; testers were even able to carry it around with one hand. Yakima's SpeedKnob locking system made attaching the Dr. Tray to your vehicle as easy as it can be, while also removing wobbles and locking the rack onto your hitch. The Kuat Sherpa also scored here, primarily due to its impressively light weight of 32 pounds and Kuat's use of a knob and cam system that removes wobble, although locking the rack to your vehicle requires a hitch pin. The 1 Up USA Heavy Duty Quick Rack impressed us with its small collapsed size, one of only two racks we tested that feature folding bike trays for storage. If you need a hitch rack that you can pull off and fit in the trunk the 1 UP is worth a look. In the case of roof-mounted racks, manufacturers assume that you're less likely to be removing them on a regular basis. Roof racks are more of a set-it-and-forget-it item that consumers generally choose to just leave on the roof for extended periods after the initial installation. Due to the more permanent nature of this style of rack, most of them take a fair bit of effort to install and remove. Of all the contenders we tested, the easiest to take on and off the car proved to be the Yakima Front Loader. At the front of the rack, a knob is turned until the clamping jaws make firm contact with the crossbar, while a clamp with one tensioning knob takes care of the rear crossbar attachment. Other models in our test selection, such as the Kuat Trio, employs a U-bolt system that requires hex keys to take on and off. Regarding storage, none of the roof racks we tested fold up, but they are mostly long and skinny, so you will need a place with some space to stand them up or lay them on the floor when not in use. The hand knob on the Yakima FrontLoader makes for easy removal and installation. A typical advantage of trunk mount racks is that they typically quite easy to remove from your vehicle, and they usually take up less space when not in use. Our top-rated trunk mount rack, Thule Raceway Pro, packs up small and with their Fit Dial system and ratcheting cables, was the easiest to mount and remove from a vehicle. The Thule Raceway Pro folds up into a nice compact size when not in use. We rated the versatility of the different models of bike racks by their ability to carry multiple different types of bikes. Wheel size, tire width, bicycle frame shape, and size can present issues for some racks. Racks which use a bike's frame as the primary point of contact and security often suffer in this metric due to the variety of frame shapes and sizes on the market. Racks which secure the bikes through other means, such as wheel-mounted trays, typically offer a wide range of adjustability and the capability to accommodate a variety of wheel sizes and tire widths. The Yakima Dr. Tray scored highest in versatility due to its massive range of tray adjustments, and the ability to carry bikes with tires up to five inches wide. Running a close second in the versatility rankings, the Thule T2 Pro XT is also capable of accommodating tires up to five inches wide, although it's tray adjustments are somewhat limited compared to the Dr. Tray. Ratcheting arms that clamp down on the front wheel of the bike are employed by most of the hitch mounted tray style racks we tested, eliminating frame contact and increasing versatility. The exceptions to this rule being the Saris Freedom, Swagman Chinook, and the Swagman XC2, all of which rely on clamps that hold the frames down against the tray. A small sliding strap secures the rear wheel and can be adjusted based on the wheelbase of the bike being carried. With this design, the shape or size of the frame is inconsequential. All of the tray-style hitch racks we tested have a two-bike capacity, but many of them can be increased to four bikes by purchasing an extension for the rack. The Yakima Dr Tray is easy to remove and store due to its low weight and tool free attachment system. Some models, such as the Thule Apex Swing, claim they can accommodate four bikes, but we felt the design limits its ability to do so. We found it difficult to find the perfect combination of four bikes that would load onto this rack, and even when we did this resulted in increased bike to bike contact and potential for damage. The peak capacity for most vehicles can be achieved by using a roof mount setup with multiple individual roof racks. Please note that a roof mount rack, such as our Editors' Choice Kuat Trio, can only hold one bike per unit, but the ability to put multiple units on the roof obviously increases your carrying capacity. Another roof mount rack, the Yakima Front Loader was a standout for versatility due to its ability to accommodate bikes with differing axle standards by clamping onto the front tire rather instead of attaching to the bike's front axle. Assembling and setting up your bike rack is typically a task that only needs to be completed once, so we didn't weight this rating metric as heavily as some of the others, only 10 percent of the overall score. That being said, we do feel that it is worthy of your attention. Some models of racks were easy to setup with easy to follow instructions and quality craftsmanship, while others were not, leaving us frustrated and confused. The 1 Up USA Heavy Duty Quick Rack, proved to be our highest scorer in this metric. The 1 Up is one of only two hitch racks we tested that have folding bike trays, but it was the only rack to be shipped fully assembled. Remove it from the box, fold the trays to their open position, and it is ready to mount on your vehicle and use. From an ease of assembly standpoint, it couldn't get any easier than that. Every other hitch rack in our test selection required varying levels of assembly. The Kuat Sherpa requires a fair amount of assembly but scores well due to notably well-designed shipping box that you can use to support the trays during assembly. This is how the 1Up USA Heavy Duty Quik Rack comes out of the box. No assembly required. Our highest scoring roof rack, the Yakima Front Loader bested the competition by coming fully assembled and ready to mount on virtually any crossbar. Other models of roof racks in our test selection required tools to assemble before mounting. The Yakima Front Loader comes fully assembled. Our Top Pick trunk mounted rack, the Thule Raceway Pro 2 arrived fully assembled and is, therefore, our highest scoring trunk mount rack in this metric. The other trunk mount racks in our test selection required tools to assemble. Unfortunately, bike theft is an issue in our modern world, and fancy bikes attached to the outside of vehicles can be their prime targets. Bike racks come with varying levels of security, from none at all to integrated locks that secure the rack to your vehicle and the bikes to the rack. Given the right tools and enough time though, and a determined thief can compromise even the most secure bike rack. It is our opinion that the most secure bike racks are those that utilize cable locks like the Kuat Sherpa. The long rubber coated steel cable on the Sherpa locks to a metal stud on the rack. The cable is long enough to loop through wheels to help deter theft. A similar system is employed on the Rockymounts BackStage. Both the Thule T2 Pro XT and the Yakima Dr. Tray use shorter cables that are only long enough to loop through the frame, leaving the wheels vulnerable to theft. Most of the hitch mount racks in our test selection have a locking hitch pin or a lock that secures the wobble knob, like on the Thule T2 Pro XT, to prevent would-be thieves from making off with the rack itself. The Kuat Sherpa has a semi-integrated noose style cable lock that can be looped through frames and wheels. Of the roof mounted racks we tested, the highest scorers for security use a cable lock that secures the rear wheel, as well as having the ability to lock the fork mount. Both the Editors' Choice Kuat Trio and the RockyMount Switch Hitter feature this more secure design. Lower scoring racks in our test selection only allow the fork mount to be locked and leave the rear wheel unsecured and susceptible to theft. Of all the racks we tested, the trunk mount style racks are particularly vulnerable to theft. The majority of trunk racks are attached to the vehicle with nylon webbing straps that can easily be cut with a pair of scissors or a knife. The only trunk mounted model we tested with any security features is the Thule Raceway Pro which attaches to the vehicle with steel cables and features a tensioning system with keyed locks to prevent unwanted removal of the rack. Additionally, the support arms that hold the bikes feature a cable lock to secure your bike to the rack. While this cable is relatively thin, the security features of the Raceway are quite significant when compared to other trunk mount racks in our test selection. To test durability, we tried our hardest to put all the products through their paces. We tried to take each model to the brink of their performance to see how they stood the test of time and heavy use. Luckily for our bikes, we did not have any catastrophic failures during our test period. All the models we tested came with the fine print warning of "not for off-road use." While we respect the manufacturers need to protect themselves legally, we did not heed this warning of keeping these racks and our vehicles on the pavement. That being said, some of the products in our test selection really shouldn't be used off road, and we've provided details about that in our test results in the individual product reviews. The 1Up USA Heavy Duty Quik Rack is nearly impervious to corrosion with all aluminum construction. From a durability standpoint, the 1 Up USA Heavy Duty Quick Rack stood out to our test team with a robust, if not overbuilt, design. A claimed weight capacity of 50 pounds per tray means you'll be hard pressed to overload it. Constructed entirely of aluminum with stainless steel hardware, the 1 Up doesn't have any plastic parts. Despite some unfortunate contact with a tree while backing up that resulted in a bent ratchet mechanism, the Heavy Duty Quick Rack continued to function without issue. The aluminum finish of the 1 Up is also of note, it may scratch, but there is no paint to chip, and it won't rust, the overall appearance of the rack doesn't change much over time. Both the Kuat NV 2.0 and the Kuat Sherpa are also top performing products; with powder coat finishes that are hard to scratch and particularly resilient against the elements. Other durable-enough-to-last-a-lifetime racks include our Best Buy winning RockyMounts JetLine, and the Best Buy Thule T2 Classic. Most hitch racks will have a little play in them. This is not ideal for the durability of the hitch and if it's really loose, the bikes will jostle around. A quick fix is a hitch tightener. Hitch tightener on a Kuat bike rack. After months of diligent testing, we've compiled the most comprehensive bike rack review ever conducted. Our professional testers are meticulous in their scrutiny and assessment of each rack and have used a variety of vehicles and types of bikes to exploit the weaknesses of each design. From daily use to long road trips, these racks have seen everything from baking summer heat to freezing cold and snow and road salt. We hope that the in-depth review we've created will help give you the tools to make a solid choice on your next rack purchase.